Je ne sais pas si vous aviez la même expérience que moi, mais depuis des années… En fait depuis que les appareils Symbian de Nokia avaient été supplantés par Windows Mobile dans mon coeur (Nokia 6600 je crois)… Depuis quelques années je découvrais mes sms (ou messages Whatsapp aujourd’hui) avec surprise car, dehors, je ne les entendais plus. Depuis que j’ai le HTC One et ses deux haut-parleurs surpuissants, je suis obligé de baisser le son pour ne pas sursauter. C’est très appréciable et ça faisait longtemps. Et vous, loupez vous toujours des messages? 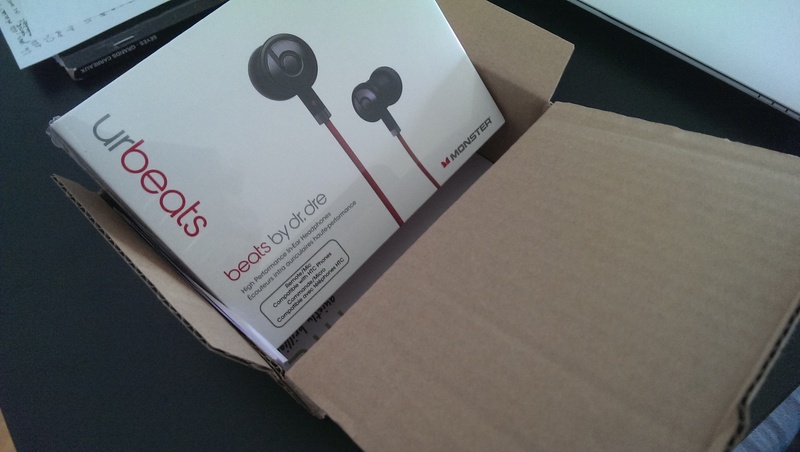 Having bought the O2 version of the HTC One , I was entitled to an additional Monster UrBeats headset. 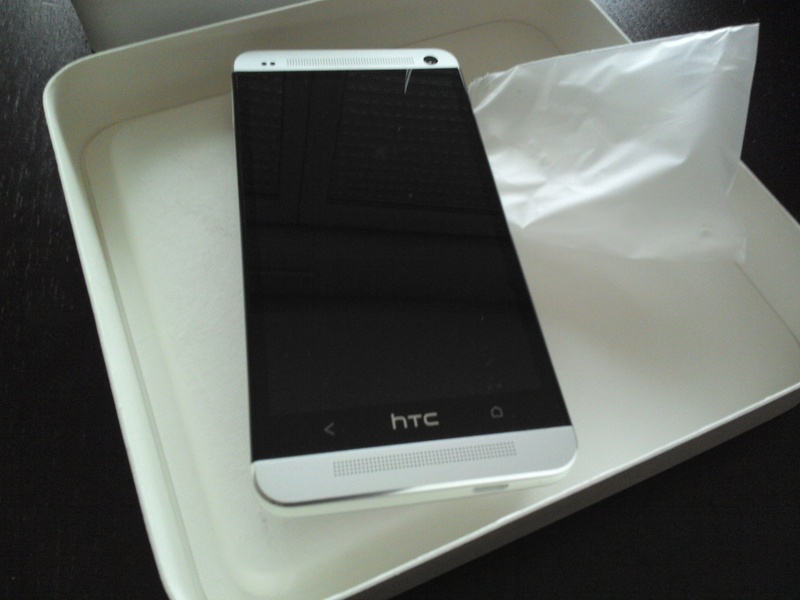 It has just arrived and this reminds me that I have now spent two weeks with my new HTC One. It is the right time to write a first assessment. First, the battery life. In my little test of the Motorola Razr i, I praised the performance of Motorola’s gifted-child while reminding that the screen size contributed to the battery life. Well, if you are looking for a smartphone with similar battery life without compromising on screen size, Htc’s One is made for you! My first working day, it literally caught me off guard. I finished my day at 11pm with 55% of battery use (45% left). I would only charge up the Htc One on the next day around noon. And that without the Energy Saving Mode please! However, should you decide to use Google Now, you’ll get back to Htc One X levels of performance. So, barely making it to midnight. The following day, I thus made it a point to listen to music (with the Beats Solo I got with the One X last year) during my three-hour walk around my new hometown: Frankfurt upon Main, during which I didn’t forget to chat and send snapshots on Whatsapp with my sweetheart, whom I left behind in Strasbourg for now. The result was: I made it home at midnight with 20% left. I am, as you can imagine, very excited about the battery life. I can say goodbye to the car lighter cable when I decide to listen to music in the car; even for my trips back to Strasbourg for the weekend (2h-2h30 drive according to traffic). Zoe and Zoe Share are fun and bring snapshots and albums to life, but they will not change my life. That being said, the pictures are very clear and the details are very fine. In low light, during my Frankfurt field trip, I was not too impressed with the pictures I took from buildings that were a bit far off. Before the Htc One came out, I had been disappointed by the company’s decision to reduce the number of panels and not give the opportunity to remove the Blinkfeed. The lack of panels was not a such a problem, and I quickly got used to using shortcuts rather than widgets, which I still somewhat regret. It is a question of freedom of choice and UI aesthetics. The Blinkfeed is nice but it doesn’t bring much and I might go two days without thinking about using it. Also, the feeds are not always consistent with my category choices. And I still have not found a way to go up the pages quickly to the first feed. What I miss the most: the FriendStream. For the simple reason that I loved having the chance to see the Tweet and the page its link leads to right underneath: images of course, but also any web page, which the Twitter app cannot do yet. I complained about it to HTC and they said it might be implemented again in coming updates… Or not. Finally, even though I am very happy with my new smartphone, I can’t help but thinking that HTC shot a bullet in their and our foot by deciding to produce a very nice looking smart protection, but by making it half a millimeter too big, which makes the smartphone fly out when it is too roughed up. A little stressful. I hope HTC will correct this mishap and, maybe, agree to exchange the protections of those who had decided to trust them from the start and suffered from their lack of preciseness. 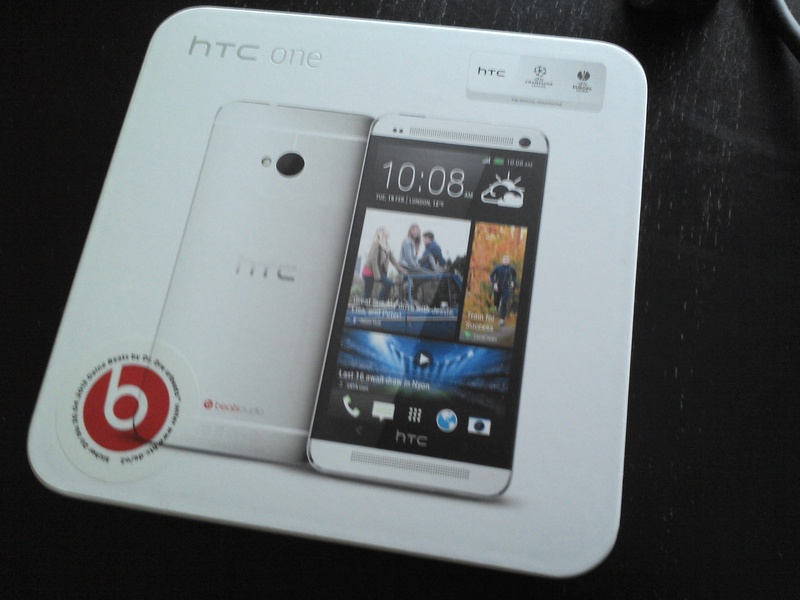 Ayant acheté un HTC One dans le cadre d’une promotion O2, j’avais droit à des écouteurs supplémentaires Monster UrBeats. Ils sont arrivés ce matin et cela me rappelle que deux semaines se sont écoulées depuis que mon expérience HTC One a commencé. C’est le bon moment de faire un premier bilan. Tout d’abord, l’autonomie. Dans mon petit test sur le Motorola Razr i je louais le performance du petit surdoué de Motorola tout en rappelant que la taille de son écran contribuait largement à son autonomie. Bien, si vous souhaitez un smartphone d’autonomie similaire mais ne souhaitez pas faire le compromis d’un écran de taille inférieure, le Htc One est fait pour vous! Le premier jour de travail, il m’a pris au dépourvu. Je terminais ma journée vers 23h avec 55% de batterie. Je ne chargerais le Htc One que le lendemain en fin de matinée. Et ce sans activer le mode Économiseur d’énergie! Par contre, si vous décidez d’activer Google Now, vous reviendrez à des performance de Htc One X. Soit, tout juste en fin de soirée. Les jours suivants, j’ai donc mis un point d’honneur à écouter de la musique (avec les Beats Solo offerts avec le One X l’an dernier) lors de ma balade de trois heures à travers ma nouvelle ville d’accueil: Francfort sur le Main, durant laquelle je n’ai pas oublié de discuter et partager des clichés sur Whatsapp avec ma dulcinée restée pour le moment à Strasbourg. Résultat des courses: arrivée vers minuit à la maison avec 20% de batterie. Vous l’aurez compris, je suis très enthousiaste pour ce qui est de l’autonomie de la batterie. Fini le câble allume cigare dans la voiture lorsque je décide d’y écouter de la musique. Même pour les voyages de retour à Strasbourg pour le week-end (2h-2h30 selon le trafic). Zoe et Zoe share sont amusants et donnent vie à vos clichés et albums, mais ils ne changeront pas ma vie. Ceci dit, les photos sont très claires et les détails ressortent bien. En basse luminosité, lors de ma balade dans Francfort, je n’ai pas été très impressionné par mes clichés des bâtiments qui étaient un peu loin. Avant la sortie du Htc One, j’avais été déçu par la décision de ma firme préférée de réduire le nombre de panneaux disponibles et de ne pas donner la possibilité de désactiver le Blinkfeed. Le manque de panneaux ne m’a pas posé de problèmes outre mesure, prenant vite l’habitude d’utiliser des raccourcis plutôt que des widgets, que je regrette quand même un peu. Question de liberté de choix et d’esthétique .. Le Blinkfeed est sympathique mais il ne m’apporte pas grand chose et il m’arrive d’oublier de l’utiliser pendant deux jour, dautant que les feeds ne sont pas toujours pertinents ou cohérents avec mes choix concernant le type d’articles. En outre, je n’ai pas trouvé le moyen de remonter rapidement en haut des feeds. Ce qui me manque le plus, FriendStream. Pour la simple raison que j’adorais avoir la possibilité de choisir un Tweet et de la voir apparaître avec son contenu en dessous: image bien sûr, mais aussi pages web, ce que ne fait pas encore l’application Twitter. Je m’en suis plaint à HTC et il se peut qu’il soit rétabli dans une mise à jour… Ou pas. Enfin, même si je suis très satisfait de mon nouveau smartphone, je ne peux m’empêcher de penser qu’HTC nous a fait un cadeau empoisonné en décidant de produire une jolie protection à rabat, mais en la faisant un demi millimètre trop grande, ce qui fait sortir le smartphone de ses gonds s’il est trop bringuebalé Pas très rassurant. J’espère qu’HTC corrigera la tir et, peut-être, qu’il consentiront à échanger les protections de ceux qui leur on fait confiance dès le début et qui font les frais de leur incurie. Another Little Mess Up for HTC? After the delay caused by the Ultrapixel sensor shortage. It seems that the smart protection designed by HTC, with its nice red color inside, might be prettier than efficient. Indeed, the HTC One seems slightly too narrow to fit into the plastic case. Is this a freak event or will HTC have to redesign the case? Après le retard dans la livraison des appareils, lié à une pénurie du capteur Ultrapixel. Il semblerait que la protection à rabat confectionnée par HTC, avec sa belle doublure rouge, soit plus jolie qu’efficace. En effet, le HTC One semble légèrement trop étroit pour être bien calé dans la coque arrière en plastique. S’agit-il d’un défaut isolé ou la firme devra-t-elle revoir sa copie ? This afternoon, my favorite electronics store took pity of me as the realized my birthday present was one month overdue. They decided to sell me an HTC One, which normally is only for sale with a contract. I have to say that HTC had let me down bit last year with the One series and their eggs boxes. This time the feeling is different. The packaging gives an image of a real box like in the days of the Sensation XE. But once the lid is pulled, reality takes its toll. The textures are the same as the One X’s eggs box. At that moment, I have no choice but to realize how bipolar I am when I am a consumer. Indeed, as many of us, I am somewhat aware of environmental issues (although I do consume my fair lot of rare earths). Unfortunately, when I am faced with this box made with recycled materials and printed with soy ink, I can’t help but raising an eyebrow. 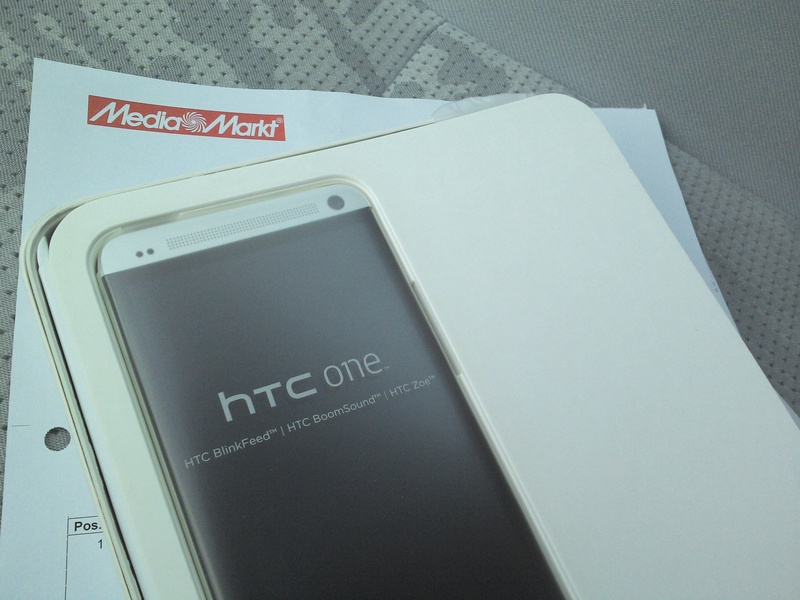 I have to get it together and admit that HTC did a great job combining eco-friendly and good looking. 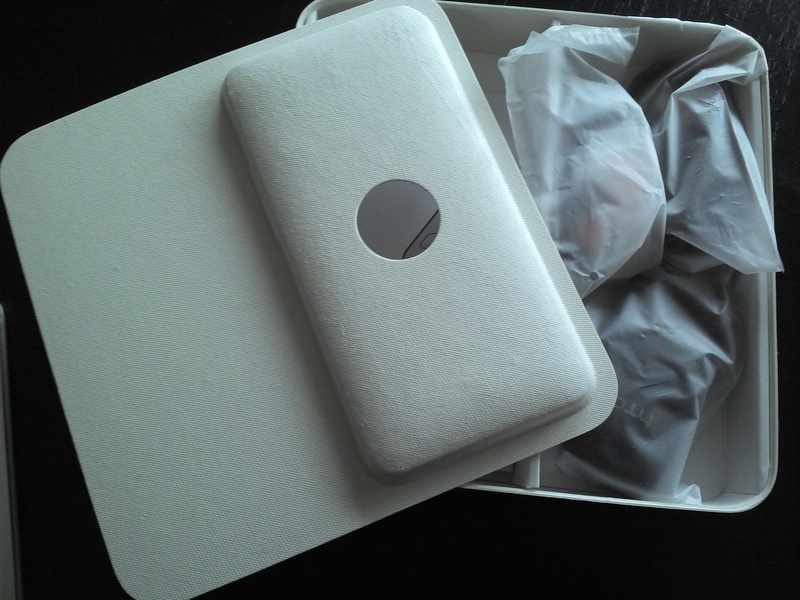 Also, truth is that the packaging is not the most important point when time comes to discover HTC’s new flagship device. Once all protections are removed and the sim is inserted, it is time to rock and roll. I was rather apprehensive of the Blinkfeed but I got around the issue by assigning the sole Twitter feed to Sense5’s key widget. I will however have to abandon some of the widgets I liked so much and which were sacrificed for the sake of the Blinkfeed. Those are my first impressions for my original encounter with the HTC One. The major teaching of the day is my consuming bipolarity. How about you? Do you take some outside issues into consideration when buying goods, or am I just a tortured mind? Cet après-midi, mon magasin d’électronique préféré a pris pitié de moi, se rendant compte que mon cadeau d’anniversaire était en retard d’un mois. Ils ont donc décidé de me vendre un HTC One qui n’est normalement destiné qu’à être vendu avec abonnement. Suite à cette annonce inespérée, je me rue donc vers mon magasin préféré et en ressors avec le nouveau HTC One. Il faut dire qu’HTC m’avait un peu laissé sur ma faim avec les premières séries One et leurs boîtes à oeufs. Ici, l’impression est différente. L’emballage donne l’impression d’une vraie boîte comme aux temps des Sensation XE. Mais une fois le couvercle levé, il convient de revenir à la réalité. Les textures sont les mêmes que celles des boîtes à oeufs. A ce moment, je suis forcé de me rendre compte que je suis bipolaire lorsque je deviens consommateur. En effet, à l’instar de beaucoup d’entre nous, je suis sensible à la problématique environnementale (bien que je sois un grand consommateur de terres rares). Cependant, lorsque je suis face à une boite en matériaux recyclés imprimée à l’encre de soja, je ne peux m’empêcher de soulever un sourcil. Il faut donc se reprendre et avouer qu’HTC a bien réussi à allier matériaux recyclés et esthétique. Enfin, il faut bien avouer que le packaging n’est pas vraiment le plus important à l’heure découvrir le nouveau fleuron d’HTC. Une fois les plastiques enlevés et la sim insérée je peux me lancer. J’avais des appréhensions concernant Blinkfeed mais je les ai quelque peu contournées en assignant uniquement Twitter aux flux du pilier de Sense5. Je ne peux malgré tout me faire à l’idée d’abandonner tant de widgets, sacrifiés à l’autel du Blinkfeed. 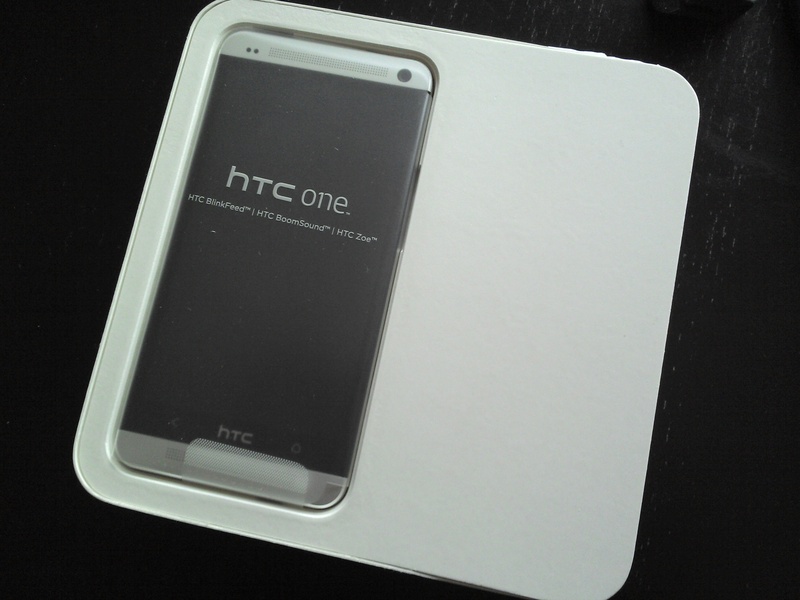 Voici les premières impressions face à cette première rencontre avec le HTC One. L’enseignement majeur de cette journée est que je suis différent en tant que personne et en temps que consommateur. Et vous? Prenez-vous du recul à l’heure de consommer ou ne suis-je qu’un esprit torturé?